It is designed with dual solar charger usb ports for more convenience to facilitate concurrent charging of 2 devices, making it an ideally suitable travel backup battery & portable cell phone charger. This adds to the handiness if this portable solar charger's shell is made tough wear-resistant plastic, waterproof, shockproof, dustproof and metal hook for hands-free or hang it on backpack wherever you go. 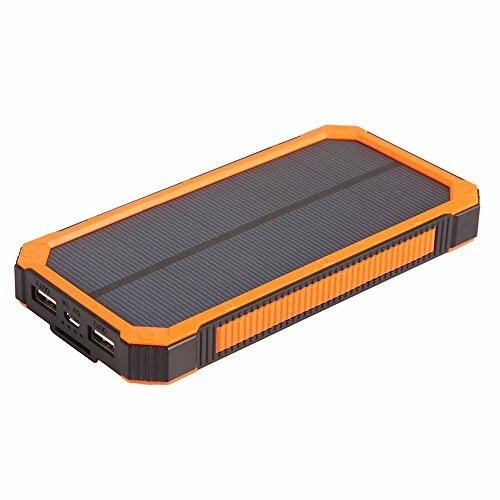 This Portable Dual USB Solar Battery is designed with 2 built-in LED light which incorporates 4 LED indicators to show power status & 6 LED flashlights to brighten your night when going for outdoor activities like camping travelling, fishing, beach, & hiking. With 100% money back guarantee you can purchase from us with confidence knowing very well any faults or if for any reason you find a mistake with the product you will be refunded or receive a replacement. • DUAL SOLAR CHARGER USB PORT: For more convenience it is designed with dual output USB Ports to facilitate concurrent charging of 2 devices, making it an ideally convenient travel backup battery & portable cell phone charger. • BRIGHT LED FLASHLIGHT: This Portable Dual USB Solar Battery designed with 2 built-in LED light has incorporated 4 LED indicators to show power status & 6 LED flashlights to brighten your night when going for outdoor activities like camping. • LIFETIME WARRANTY: 18-months warranty - charger, micro usb cable, user manual, carabiner; call us if you find any fault with our product for 100% money back or a replacement. If you have any questions about this product by WakeUp, contact us by completing and submitting the form below. If you are looking for a specif part number, please include it with your message.